Born in the townland of Drumderg in the parish of Ballinascreen (Draperstown) - he was very proud of his home and background, it was always very close to his heart. He spoke lovingly and with deep emotion of his parents and the old homestead. His education was at the local primary school and St Columb's College and then on to Maynooth. He obtained a degree in classical studies and also excelled in Irish language. He wore his academic achievements with great humility. Being in his presence a lifetime, one would never have heard him say nor could one guess that he was a man of great learning. His priestly life can be reflected on in two parts - his life in education as teacher and school principal and his life as a priest in the parish. 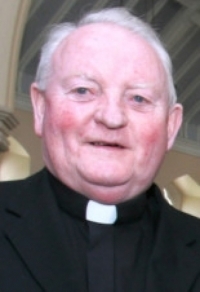 His teaching career began in Carndonagh College in 1960, in 1963 he moved to a teaching post in Maghera where he remained until 1971 when he once more returned to Carndonagh College. From 1973 until his leaving education in 1991 he was principal of Carndonagh Community School – this school was an amalgamation of Carndonagh College, the Convent School and the Technical school. The school there became the biggest school in the Republic of Ireland and possibly in these islands. Despite the huge number of pupils he knew every pupil by name and all about them. Fr Kevin had a tremendous love for Inishowen and Donegal. He knew almost everyone in north Inishowen. He often reflected on his trips to the Gaeltacht and late nights spent at Malin Head looking at the Northern lights. After leaving Carndonagh he had a very pleasant transition year in Kilrea. From Kilrea he moved to Waterside as Parish Priest. It was a culture shock for all involved. After six pleasant years in Waterside he moved to Dungiven from where he retired. Dungiven was special to him; he lived in Dungiven in retirement and it is where his eartjly remains are laid to rest. Fr Kevin was a man of faith. Like his academic brilliance, Father Kevin didn't parade his faith in public. He allowed Jesus his privacy in the oratory; his faith like his life was simple and uncomplicated. His faith was centred on the Eucharist and a devotion to Mary the Mother of God. "Our faith is simple," he said "you either believe the words of Jesus or not. It's as simple as that." For Fr Kevin there was no in between, he accepted the words of Jesus as true, no ifs, buts or questions. He was always very aware of his own human weaknesses and his mortality but he never doubted the love of God and looked forward to the promise made by Jesus of eternal life for those who believe and reunion with all those loved ones who have gone before. We are grateful to God for the life of Father Kevin who brought variety and richness to the tapestry of our lives.